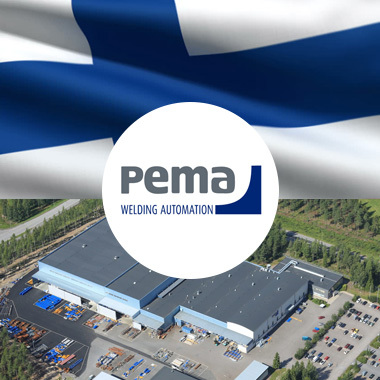 The company Pemamek is a global leader in welding and production automation. Specialized in designing and manufacturing automated welding and production systems, as well as work-piece handling equipment, our competence has been recognized worldwide. The company is a privately owned limited company with solid finances (an AAA-rated company). We have a modern, technically advanced factory in the city of Loimaa in Finland. PEMA Sales Offices are located in Russia, Brazil and Poland. The skill and energy of our project teams as well as their constant interaction allow us to tailor our work to our clients’ individual needs. Depending on the requirements of the project in question, the project team may also include the best subject matter experts, such as software engineers, shipyard engineers, simulation specialists etc. In order to maintain a competitive edge in a modern heavy fabrication industry, efficient high-quality welding and production automation solutions are required. Pemamek provides work piece handling, hard automation and flexible robot systems that ensure safe operation, ergonomic comfort and good-quality with high output. Effective handling of heavy steel structures is just as important for productivity as the welding process itself. With shorter throughput times, productivity is multiplied. With enhanced ergonomics operator comfort and safety are increased resulting in more motivated work force and higher quality output. Essential for welding of cylindrical work-pieces. Ideal equipment for every automation solution. PEMA TW Series Assembly Stations. PEMA positioners, roller beds, and welding columns & booms. Robotised Welding for Heavy Performance. Component manufacturing for mobile machinery is a demanding task. It requires expert knowledge of high-strength and wear-resistant materials, manufacturing processes, particularly welding, and the ability to meet tight tolerances and delivery times without compromising the quality of the end product. PEMA solutions for mobile machinery customers eases these production challenges by fulfilling the requirements above — and more. The flexibility of PEMA equipment allows the production of numerous components with a large variety of material types, material thicknesses, weld joint types and welding process-combinations. When implementing factory automation, PEMA welding and production cells are the basic building blocks. When there is a manufacturing demand for high production volumes, specially engineered machinery is the solution. The challenges in steel structure manufacturing are mainly due to the immense sizes of steel structures that need to be handled, the timescales involved and the need for maximum safety. PEMA’s integrated solutions are ideal for steel structure manufacturing of units and elements, such as building frames, bridge blocks, crane box beams and harbour structures. They increase end-product safety and durability, reduce customer costs, minimise business risks caused by poor-quality welding and ensure timely completion of projects. Welding Automation in Steel Building Production. PEMA innovative solutions make it possible to increase shipyard’s production capacity and gain competitiveness in the market Extensive Experience Guarantees Ability. PEMA’s knowledge of the mechanization and automation of modern shipbuilding and offshore industry steel production has a 40 year history. Decades of cooperation with the industry has resulted in the development of PEMA’s tailor-made prefabrication and production lines and automatic welding stations. A leading supplier in this field, PEMA enables its customers to profitably manufacture even the most demanding product types, such as thin-sheet panels and high double-bottom constructions. When the block is not closed we can provide an automated or a robotized welding solution to weld webs and bulkheads. The pipe welding gets a boost in productivity. Providing both Flexible and Efficient Equipment for Boiler Manufacturer Needs. In the production of critical components, there is absolutely no room to compromise on quality. Therefore, quality must be built into the production process. In PEMA production lines, solid and robust quality comes as standard. With several decades of experience behind us, PEMA understand that safety and quality are critical factors in the boiler industry. If you require various sizes of tubes and fins with varying production batches, we can offer flexible panel lines. The PEMA panel welding line is designed for mass production of water tube panels. Double welding machine panel lines and coil shops require efficient tube lines. Our know-how in heavy-duty welding applications opens new possibilities for boiler manufacturers. The best productivity rate and premium quality in onshore and offshore demands are reached using hi-tech and modern welding and production automation. PEMA solutions for wind tower and foundation production have been proven to increase overall efficiency in production plants. Radical Improvements in Production Efficiency and Quality. Pema wind energy solutions are designed especially for steel structure welding and production automation for wind towers and wind tower foundations. We are able to provide you with tools to increase the capacity and quality of your end product and thus raise your level of competitiveness. All lines are modular and designed based on the customer’s production capacity needs. PEMA solutions for Offshore wind tower and foundation manufacturing. PEMA Onshore Wind Tower and Foundation Manufacturing. The blasting and cutting of plates. Efficiency and quality through the production line. PEMA is a reliable and experienced partner for large-scale welding automation investment projects. PEMA CM 55 milling machine. Special Solutions for Welding and Handling of Extra-Heavy Workpieces. The PEMA range of products for process and nuclear industry steel production has been developed to safely and efficiently handle the extremely heavy steel structures and unconventional alloys used in the production of, for example, pressure vessels for process and oil industries and nuclear reactors. PEMA solutions raise delivery reliability, improve production cost control and predictability and reduce preform wastage. The use of traceable welding parameter recordings improves quality assurance and end-product safety. Maintaining a competitive edge in the process and nuclear industry requires automated high-quality production solutions.